Research proves that meaningful interactions with nature supports creativity and problem solving, enhances cognitive ability, improves academic performance, reduces Attention Deficit Disorder symptoms, improves self-discipline, eyesight, nutrition and reduces stress amongst a range of other benefits. These findings are becoming increasingly significant, given that children now have limited opportunities to connect with nature. Nature presents ample opportunities for children to investigate and inquire, and provides a calming influence as well. In natural environments, children engage with the world through their senses and develop awareness of their surroundings. These contribute to their development into global citizens who are socially and environmentally conscious. One example of an innovative and naturalised outdoor learning environment is EtonHouse at 717 Mountbatten. It is designed to seamlessly connect nature to children’s everyday learning, where learning is not just limited to the four walls of the classroom. Features of the school’s generous outdoor space include biodiversity and edible gardens where fresh produce harvested by children is used in food preparation experiences in the Cookery Lab. The school also has a customised tree-deck playground built around a Yellow Flame tree. The school’s innovative use of space is also evident in its bold step in placing specialist studios for visual arts and construction in the outdoor environment. In the construction studio, the combination of building blocks, stumps, logs, branches, tyres and natural materials promotes constructive play and encourage the development of fine and gross motor skills. 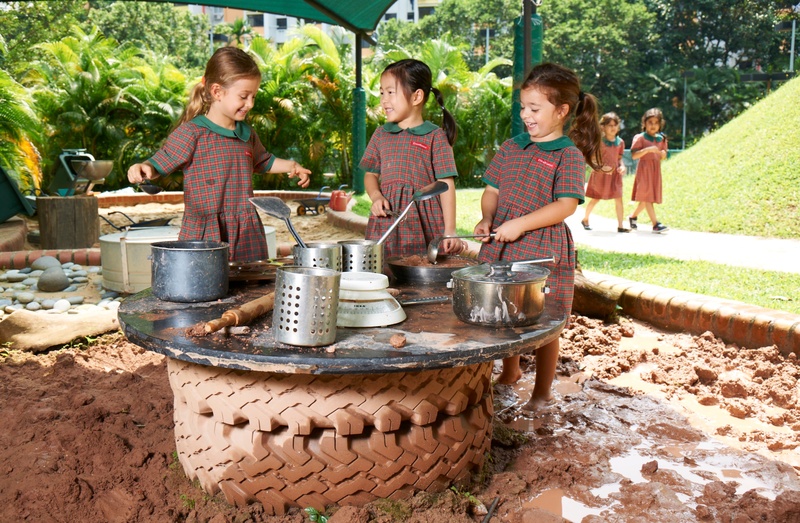 At another EtonHouse campus in Thomson, classrooms and indoor spaces open out to the outdoors allow children to play with and among natural elements such as sand, water and plants. 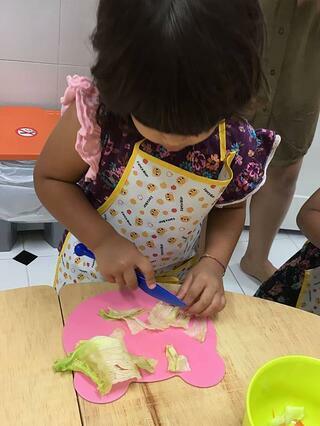 Children, therefore, have multiple opportunities in a day to spontaneously go out of their classrooms or outdoors with educators who work alongside them to support and facilitate their investigation, observations and research. In the outdoor environment, there are no visible boundaries to the learning spaces and furnishings are seamlessly integrated with its setting so that there is no sense of where each space begins and ends, unlike in a conventional clearly defined layout. This makes it far more inviting for children to explore their surroundings and creates much flexibility in the use of the environment. For example, when a bigger space is required, educators have the freedom to extend each space, therefore making learning dynamic and exciting. In highly urbanised cities like Singapore, it is easy for children to lose connection with nature. Video games, digital devices, shopping malls and indoor classrooms affect children’s learning and development and increase their stress levels and health problems. It is important for our children to spend time in green environments. Let us move away from being over-reliant on manufactured play equipment and instead, focus on giving our children naturalised and green materials! Experience our inspiring outdoor learning spaces at our EtonHouse campuses.